One of the last dinosaurs on earth, Leptoceratops roamed North America in the late Cretaceous 66 million years ago, but it looked like a throwback to an earlier time. 1. Leptoceratops Lived in a Celebrity Cousin’s Shadow. Few prehistoric animals can claim to be even half as famous as Triceratops. The big, beaked herbivore has provided South Dakota with an official state fossil and the Colorado Rockies with a mascot. As one of the most advanced ceratopsians (or “horned dinos”) we’ve ever found, its scientific value can’t be overemphasized. 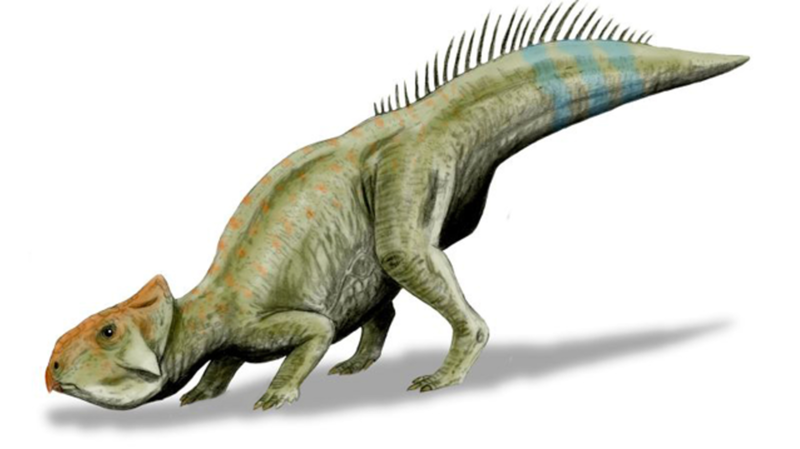 And then there’s Leptoceratops, which looks surprisingly primitive by comparison. This little creature has several traits in common with very early ceratopsians, including a total lack of horns and an almost nonexistent frill. Nevertheless, it shared North America with Triceratops 66 million years ago. Size differences only heightened the contrast: a fully-grown Leptoceratops could’ve walked under the bigger dino’s belly. 2. Most Scientists Think It Had Cheeks. Scientific illustrators generally draw ceratopsians with fleshy “cheek tissues” covering the sides of their mouths. In life, this would’ve been a useful way to keep excess food from falling out. However, during the late 1990s, two paleontologists questioned the concept. Perhaps, argued Michael Papp and Larry Witmer, Leptoceratops and its brethren lacked cheeks altogether. Maybe, instead, the horny sheaths over their beaks were tall enough to hold back those wandering morsels. However, most experts prefer the traditional idea. 3. It’s Primarily a Canadian Dino. Though some Wyoming specimens are known, Alberta is where the very first Leptoceratops fossils turned up. Most subsequent individuals have emerged in that province as well. Two are now on display at the Ottawa-based Canadian Museum of Nature. 4. Leptoceratops' Palms Were Oriented Towards Each Other. One 2007 analysis found that Leptoceratops habitually kept its hands in a “clapping” pose. This marks yet another dissimilarity from the more advanced ceratopsians, whose palms faced downwards. Speaking of limbs, the general consensus holds that Leptoceratops could’ve gotten around (at least for short distances) on both two legs and on all fours. 5. It Might’ve Lived in the Hills or Mountains. In an attempt to explain why Leptoceratops bones aren’t nearly as common as material from Triceratops, field collector extraordinaire Charles M. Sternberg suggested that the two lived at very different elevations. “One might hazard a guess,” he wrote in 1947, “that… the smaller and more primitive [ceratopsians] usually remained on the upland, and therefore, were not so often preserved as fossils.” If Sternberg was right, it’s tempting to speculate about a mountain goat–like existence for Leptoceratops while bulky old Triceratops meandered through the lower floodplains. Back in 1910, Barnum Brown, another legendary paleontologist, spotted two skeletons that belonged to an animal he dubbed “Leptoceratops gracilis” four years later. Unfortunately, the pair emerged beneath a pathway that had been frequented by cattle, which trampled the exposed pieces. 7. … Right Before a Horned Dinosaur Hot Streak. The 1910s were a great time to be a ceratopsian fan. In the years 1913 and 1914 alone, North American scientists named Leptoceratops, Anchiceratops, Chasmosaurus, and Styracosaurus. The latter has gone on to enjoy a healthy cinematic career. 8. Leptoceratops Had a Leaf-Shaped Tail. Viewed in profile, it would’ve looked tall and flattened from side to side, courtesy of some elevated spines atop several vertebrae. 9. The Leptoceratops Genus Once Lost a Species. In 1942, Brown and his colleague Erich Schlaikjer formally described a 72-million-year-old animal they called Leptoceratops cereorhynchos. However, Sternberg subsequently decided that the creature deserved a genus of its own. So, he rechristened Brown and Schlaikjer’s beastie Montanoceratops cereorhynchos, as a tribute to its home state. 10. Leptoceratops Could Help Us Solve an Australian Mystery. Australia is well known for its wide array of uniquely weird animals. Yet, for all its modern biological wealth, Australian dino fossils are frustratingly scarce. Just over a dozen native species have been found. In 2003, a new one entered the fold. But there wasn’t much to go by: just a single ulna (upper arm bone). Married paleontologists Patricia and Thomas Rich noticed that the ulna looked distinctly Leptoceratops-esque, so they identified it as a ceratopsian and named it Serendipaceratops. If Serendipaceratops does, indeed, hail from the same gang as Leptoceratops and Triceratops, it could throw a monkey wrench into our perception of horned dinosaur evolution. (For starters, no other ceratopsians are known from Australia.) But the case is far from closed. In 2010, an international team argued that Serendipaceratops is too poorly understood to be commented upon with any authority.